Only in the world of German performance cars can 306PS and a 0-62mph time of 4.7 seconds be merely considered to be ‘warm’. 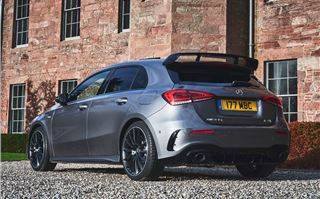 The new Mercedes-AMG A 35 is set to plug the gap between the ‘normal’ A-Class range and the upcoming A 45 - Mercedes-Benz’s Audi S3, if you like, or a competitor to the ever-popular Volkswagen Golf R.
Powered by a 2.0-litre four-cylinder turbocharged petrol engine as is the norm in this sector, the A 35 comes with a seven-speed dual-clutch transmission and produces a handy 400Nm of torque. Oh, and there’s four-wheel-drive, of course - which is useful as our first experience of the A 35 in the UK was on rural Aberdeenshire roads with January temperatures plunging below freezing as night time set in. Our first impressions, then, are of the A 35’s interior. And what an interior it is. Largely the same as the standard A-Class - which itself is a thing of beauty - the A 35 has a few sporting touches, like AMG badges here and there as well as an AMG performance steering wheel. It’s not a radical overhaul (AMG will be saving that for the A 45), but it’s such a pleasant interior as standard, that’s not a bad thing. The seats are really comfortable - not to be taken for granted for hot hatchbacks - and you could happily cover a lot of miles in the A 35. 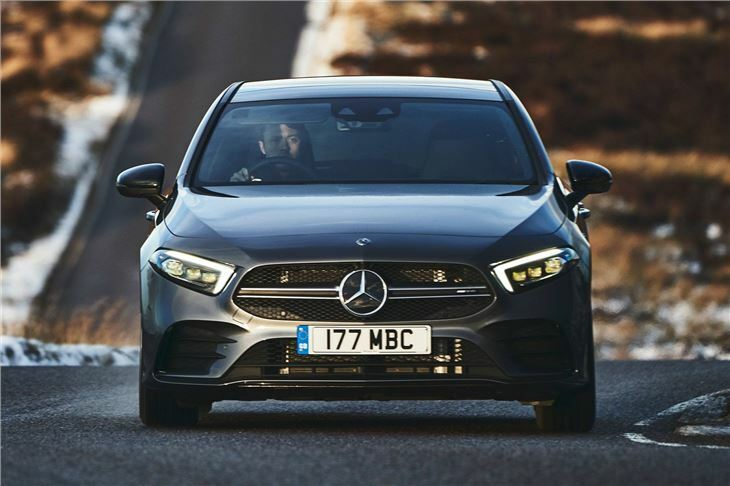 The brand’s slick new MBUX infotainment system is standard, along with its Siri-mimicking ‘Hey Mercedes’ voice activation feature. 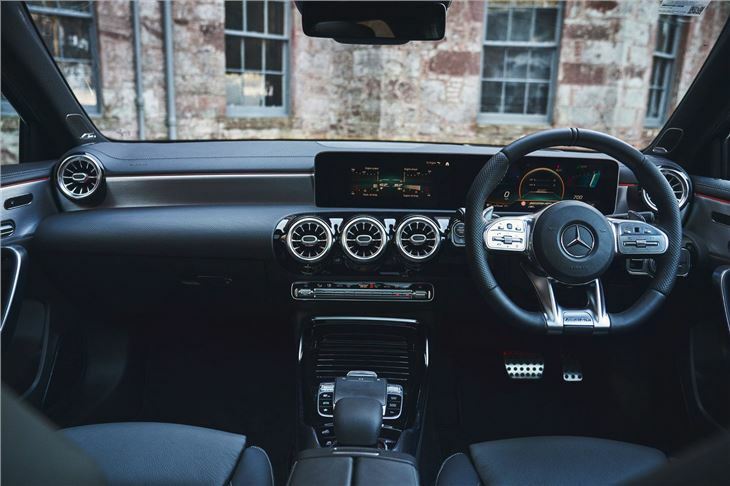 The AMG Executive pack is a worthwhile extra at £1395, with its 10.25-inch multimedia display as well leather seats (heated up front) and some helpful parking assistance tech. 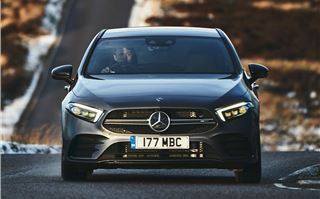 If you’re going to opt for that, you may as well go a step further and tick the box for the £2395 AMG Premium equipment line which adds a 10.25-inch digital instrument cluster and some very pretty ambient lighting as well as some other useful features including the currently unfashionable keyless entry. 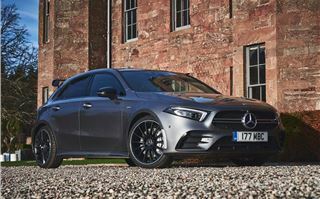 If you’ve got some money left in the monthly PCP budget, there’s also the £3895 for the AMG Premium Plus equipment line which adds a Burmester premium sound system, a panoramic glass sunroof and electric front memory seats. And if you want the ultimate in tech, the Advanced Navigation package can be added to any of these lines, with its clever augmented reality nav as well as a head-up display and traffic sign assist. All clever features but, for the ultimate jaw-dropping A 35 interior, you can very quickly start spending a serious amount of money. With the nitty gritty out of the way, how does the A 35 drive? 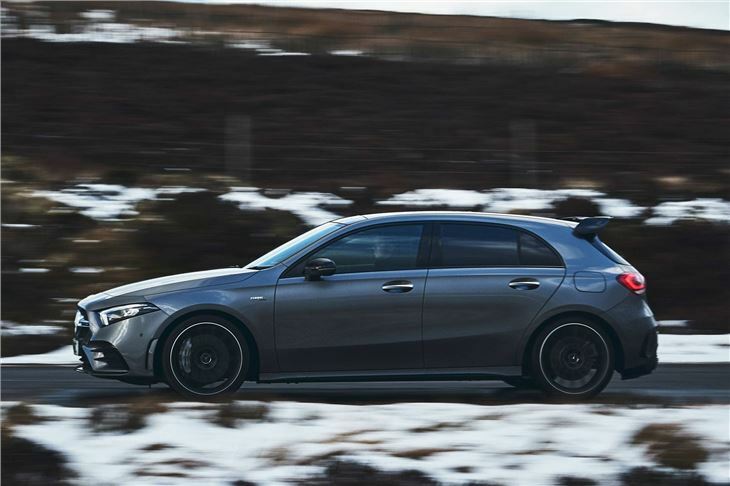 While a journey across a snowy rural Scotland in some hot hatches would fill us with dread, the A 35 is a cosseting, sure-footed car in the same ilk as the Volkswagen Golf R. That’s not to say it isn’t exciting - it is, with plenty of performance on offer, and fiddling with the selectable drive modes can make the exhaust pop in a most childish yet utterly addictive manner. It's quick, obviously, but you do get the sense that AMG's held a bit back for the A 45. There's plenty of power for rapid overtakes, but it doesn't shove you back in your seat as much as you may expect. 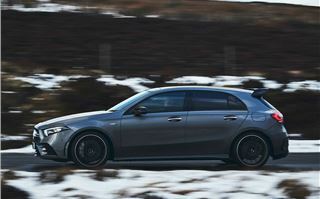 There is a sense that this is little more than a fairly quick A-Class rather than a 'proper' AMG model. 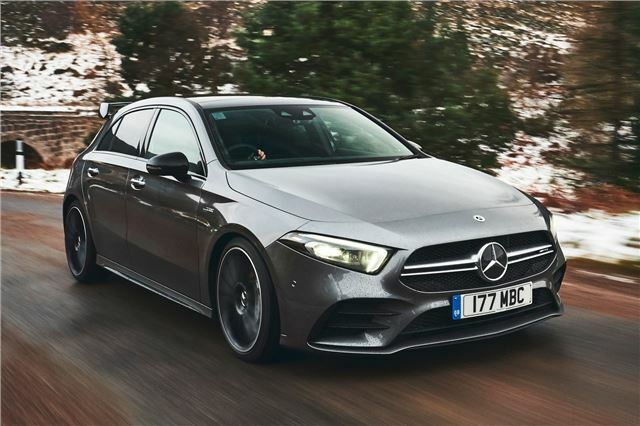 In fairness, it is more exciting than the aforementioned Golf - and it might just be the ever more dramatic hot hatches on the market that leave us wanting a little more. The steering is well weighted and communicative, to a point. It’s fine, but with the A 35’s impressive desire to turn in, you have to be pushing it very hard before the steering hints that the front wheels aren’t going quite in the direction you want them to. The adaptive dampers fitted to our test car (another £695...) are best left in comfort mode on UK roads while the four-wheel-drive system ensures there’s plenty of grip available, even in less than brilliant conditions. It also does this without eating into interior space, which is handy. That means there’s the same 370-litre boot as the standard car, while dropping the rear seats creates some useful additional space. Access to the rear is easy and a couple of adults will fit in the back, although you might want to consider something bigger if you regularly drive four-up. Officially the A 35 will return a combined 38.7mpg, which is respectable for a car of this performance. Obviously, this will take a knock if you drive everywhere flat out, but on our drive we were seeing mid-30s mpg from the trip computer fairly easily. After the first year, road tax is £140 a year, unless you spec it to more than £40,000 when it’ll become £450 a year - something to bear in mind when you’re going through the options list. 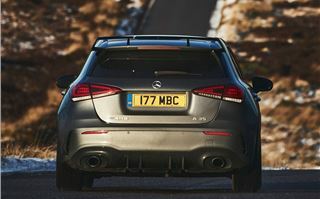 The Mercedes-Benz A-Class is arguably the best premium hatchback on the market right now and, for the time being, the A 35 is the best example of that. 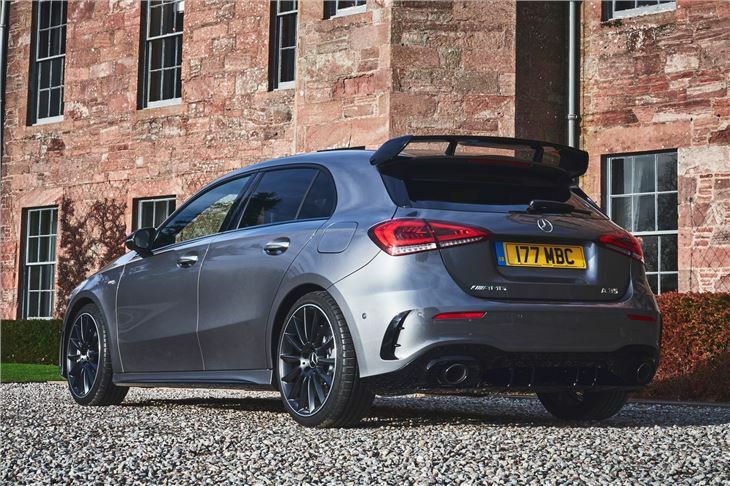 Most people won’t feel the need to hold on for the A 45, it’s that good. The interior is splendid (although you do have to raid the options for the maximum feel-good), and it’s a very, very capable car to drive. It has enough power for most of us, and the adaptive drive modes mean the A 35 is a car of many characters. You might be expecting a ‘but’. There isn’t one. Not really. Serious drivers might find something like a Honda Civic Type R more rewarding, but the A 35 will be a much nicer car to live with day-to-day. The biggest ‘but’ we can think of is the price, which is a hefty £35,580. By the time you’ve gone to town on options, you could be spending considerably more than £40,000 on a car which’ll soon be usurped by the A 45. 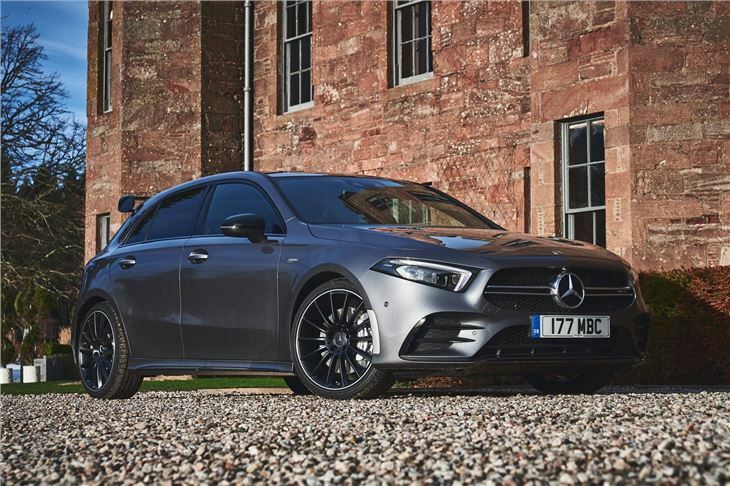 The Mercedes-AMG A 35 is on sale now with prices starting at £35,580.